Background The effect of fixture congestion on injury rates and patterns has received scarce attention in elite football and existing investigations have not accounted for player rotation or examined the temporal distribution and potential cause of injuries. Aim To prospectively investigate the epidemiology of injury during short periods of fixture congestion in a professional football club. Methods Over a six-season period, exposure time and injury data were compared in the same players (n=25 (14 individuals)) when participating in two frequently occurring short congested fixture cycles in comparison to match-play outside these cycles. (1) two successive matches separated by an interval totalling ≤3 days calculated immediately from the end of play in match 1 to the beginning of play in match 2; (2) three successive matches separated by ≤4-day intervals starting the day immediately after each match. Results In two-match congestion cycles, incidence rate ratios (IRR) showed that there was a higher risk of injury in the final 15 min of play in the second match in comparison to match-play outside the cycles (IRR: 3.1 (95% CI 1.1 to 9.3), p=0.0400). A greater risk of injury overall (IRR: 2.0 (95% CI 1.1 to 3.8), p=0.0345) and in the first-half of play (2.6 (1.1 to 6,5), p=0.0386), and risk of ankle sprains (10.4 (95% CI 1.9 to 57.9), p=0.0068) and non-contact injuries due to a ‘change in direction’ (IRR: 7.8 (1.3 to 46.8), p=0.0243) were observed in the final match of three-match congestion cycles in comparison to match-play outside the cycles. Conclusions Injury rates and patterns were affected in the same elite football players when competing in short congested fixture cycles in comparison to match-play outside the cycles. In contemporary elite football, clubs can compete in a large number of matches across the season, many of which are played within a tight time frame. Match congestion is regarded as a threat to team performance and player health.1 Yet surprisingly, only a limited number of studies have examined the effects of match congestion on injury risk and have reported contrasting findings. In two investigations examining the impact of short congested cycles that frequently occur across the season, injury risk in match-play was comparable in consecutive matches separated by a short interval (≤3 days) versus those following a longer interval (≥4 days).2 ,3 In contrast, a fivefold increase in injury incidence was observed when players participated in two successive matches played within a 4-day period compared to matches separated by 6-day intervals.4 Regarding the risk over longer periods of match congestion, one study5 reported a significant increase in injury incidence while another6 did not. However, the majority of previous studies share a limitation in that data were collected and analysed at ‘team’ level and did not account for player rotation. Therefore, the true risk of injury in the same players when exposed to periods of match congestion in comparison to match-play outside congested periods is generally unknown. Limited information is available on injury type and location over short match congestion cycles in elite football. One investigation in 27 elite European football teams reported similar muscle injury rates in matches (all competition formats) with ≤3 days recovery versus matches with ≥4 days recovery.2 In contrast, a significant increase in sustaining a muscle injury was observed in league matches separated by a short interval (≤4 days) compared to longer intervals (≥6 days). Again, the potential effects of player rotation were unaccounted for by the authors. In addition, previous epidemiological research has shown that injury rates generally and the frequency of ankle sprains and muscle strains in particular increase during the latter stages of match-play.7–9 However, no information exists on the potential effects of fixture congestion on the temporal distribution of injuries. Similarly, no data are available on the causes of injuries incurred over congested periods of play. The aim of this study was to investigate injury rates and patterns during short periods of fixture congestion in top-level players belonging to a professional football club. This prospective observational study investigated injuries sustained in match-play over a six-season period in a cohort of male professional football players belonging to the first-team squad of a French Ligue 1 Club (2009–2015). While all data arose as a condition of employment in which players were routinely monitored over the course of the competitive season,10 approval for the study from the present club was obtained. To ensure confidentiality, all data were anonymised before analysis. Over the six seasons, the club played in European Competition on five occasions: 3 UEFA Champions League and 2 UEFA Europa League participations. Individual exposure time to all official club competitions and national team play (including tournament qualification and friendly matches) was recorded for each player belonging to the first-team squad by the club's sports scientist. To examine the risk of injury during fixture congestion, exposure time and injury data were collected over two commonly occurring short congested club and national team match cycles and compared to matches outside these cycles: (1) two-match congestion cycles: two successive matches separated by a time interval totalling ≤3 days (≤72 h) calculated immediately from the end of play in match 1 to the beginning of play in match 2 (eg, match 1 played on Thursday at 21:00 and match 2 on Sunday at 17:00); (2) three-match congestion cycle: three matches played successively with each separated by a ≤4-day period starting the day immediately after each match (eg, match 1 played on Sunday at 17:00, match 2 on Thursday at 21:00 and match 3 on Sunday at 21:00). These short congestion cycles were selected due to their frequent occurrence across the season11 ,12 while the time intervals between matches are associated with a greater injury risk2 ,4 and incomplete physiological and physical recovery.13 Match-play inclusion criteria4 required players to have participated in: (1) ≥75 min play in matches played outside the above periods of fixture congestion; (2) ≥75 min play in the first match in the two-match congestion cycles and any participation time in the second match; (3) ≥75 min play in the first and second games in the three-match congestion cycle and any participation time in match 3. Participation in both congested cycles on a minimum of three occasions across the competitive season was deemed necessary for inclusion. This stringent inclusion criteria subsequently provided repeated measures in a cumulated total of 25 (14 individual players) out of a possible 150 cumulated players (35 individual players) who participated over the six-season span. The injuries sustained in match-play were prospectively diagnosed and documented by the same sports physician over the entire study period. Injuries incurred during national duties were also diagnosed (after consultation with respective national team medical staff where necessary) and documented on the player's return to the club. The definitions of injury used were based on those recommended by International Football Injury Consensus Groups.14 ,15 Injury: time-loss injury resulting from playing football and leading to a player being unable to fully participate in future training or match-play independent of whether a training session actually took place on the day following injury or the player was selected to play in the next match. The layoff time of the injury was determined according to the number of days the player was absent from and unable to take full part in training or competition. Injury type and location and whether the injury was recurrent were also documented by the physician. A recurrent injury was described as an injury of the same type and at the same site as an index injury and that occurred within 2 months after a player's return to full participation from the index injury. Information on the time and cause of injuries sustained in competition was first collected via direct questioning of the player by the club physician. If further confirmation was required, the club physician and sports scientist visualised the match video recording. If there was cause for doubt on the time and/or cause of injuries and consensus between player, physician and sports scientist was not achieved, then these variables were classified as ‘unknown’. Standard statistical procedures were used to calculate frequencies, means and SDs. The incidence of injury (number of injuries per 1000 h exposure to play) was calculated for the final match in congested cycles and for match-play outside these cycles. Injury incidences and incidence rate ratios (IRR) for comparisons are reported and presented with 95% CIs. IRR were also tested for significance using Z statistics.2 The mean layoff time for injuries across the two congested match cycles was compared to matches outside these cycles using a paired t test. A p value of <0.05 was considered statistically significant. Over the six-season study span, two-match and three-match congestion cycles occurred on 10.8±5.5 and 9.7±3.9 occasions per season. On average per season, the players participated on 7.4±3.4 and 3.4±1.6 occasions in all matches across two-match and three-match congestion cycles and on 19.4±6.9 occasions in matches outside these cycles. Total exposure time to the final match in two-match and three-match congestion cycles and in matches outside these cycles for all players equated to 269.2, 138.9 and 724.0 h play. A total of 34 injuries were sustained in match-play outside congestion cycles while 19 and 13 injuries were incurred in the final matches in two-match and three-match congestion cycles. In comparison to the incidence values in matches outside the congestion cycles (figure 1), there was a higher risk of injury, albeit non-significant, in the final match in the two-match congestion cycle (47.0 (95% CI 31 to 63) vs 70.6 (95% CI 39 to 102), IRR: 1.5 (95% CI 0.9 to 2.6), p=0.1553) and a significantly greater risk in the final match in the three-match congestion cycle (47.0 (95% CI 31 to 63) vs 93.6 (95% CI 43 to 144), IRR: 2.0 (95% CI 1.1 to 3.8), p=0.0345). 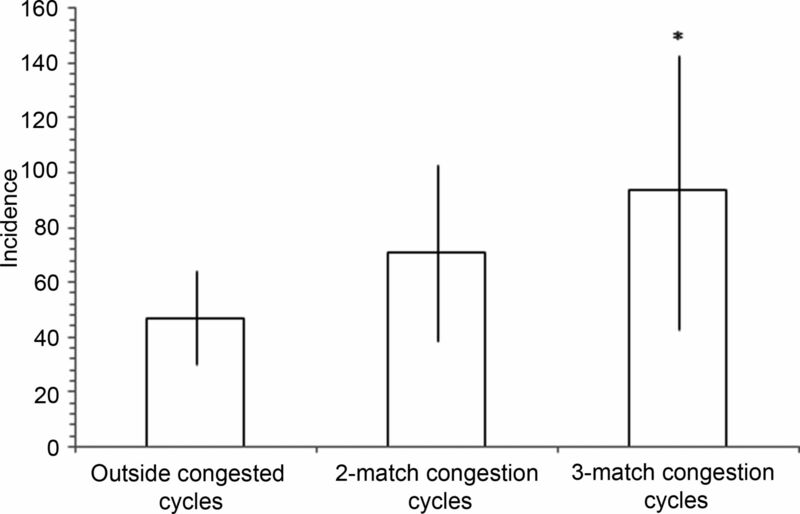 Incidence of injury in the final match of short congested match cycles compared to during match-play outside the congested cycles. Injury incidences are presented with 95% CI bars. Two-match congestion cycle: two successive matches separated by a time interval totalling ≤3 days (≤72 h) calculated immediately from the end of play in match 1 to the beginning of play in match 2. Three-match congestion cycle: three matches played successively with each separated by a ≤4-day period starting the day immediately after each match. The mean layoff time in days for injuries did not differ significantly for those sustained in match-play outside the cycles injury compared to the final matches in the two-match and three-match congestion cycles (6.9±2.9 vs 6.2±3, p=0.523 and vs 4.3±3.0 days, p=0.145). In match-play outside the cycles compared to that in the final matches in the two-match congestion cycle, the incidence of reinjury was higher, albeit non-significantly (5.5 (95% CI 0 to 11) vs 3.7 (95% CI −4 to 11), IRR=0.7 (95% CI 0.1 to 6.0), p=0.6390). No recurrences of injury occurred in the final matches in the three-match congestion cycle. A higher albeit non-significant trend was observed for the risk of muscle strains, particularly to the hamstring region, in the final matches in the two-match and three-match congestion cycles compared to that observed in match-play outside the congested cycles (table 1). In comparison to the incidence of joint sprains incurred in match-play outside the congestion cycles (figure 1), again there was a non-significant trend for a higher risk of these injuries in the final match in the two-match congestion cycle (14.9 (95% CI 0 to 29) vs 4.1 (95% CI 0 to 9), IRR: 3.6 (95% CI 0.8 to 16.2), p=0.0947) while a significantly greater risk was observed in the final match in the three-match congestion cycle (28.8 (95% CI 1 to 57) vs 4.1 (95% CI 0 to 9), IRR: 7.0 (95% CI 1.5 to 31.4), p=0.0112). The risk of sprains to the ankle region was significantly higher ((28.8 (95% CI 1 to 57.0) vs 2.8 (95% CI −1 to 7, IRR: 10.4 (95% CI 1.9 to 57.9), p=0.0068) in the final match in the two-match congestion cycle compared to match-play outside the cycles. Despite a non-significant difference, there was a higher risk of contact injury during match-play outside the cycles compared to that for the final match in the two-match and three-match congestion cycles: 22.1 (95% CI 11 to 33) vs 26.0 (95% CI 7 to 45) vs 43.2 (95% CI 9 to 78), IRR: 1.2 (95% CI 0.5 to 2.9), p=0.7209 and IRR: 2.0 (95% CI 0.8 to 5.0), p=0.1617. Regarding non-contact injuries overall, a non-significant trend towards an increased risk in the final match in the two-match and three-match congestion cycles was also observed compared to match-play outside the cycles (table 2). The risk of incurring a non-contact injury when the player performed a ‘change in direction’ when running was significantly higher (21.6 (−3 to 46) vs 2.8 (95% CI −1 to 7), IRR: 7.8 (95% CI 1.3 to 46.8), p=0.0243) in the final match in the three-match congestion cycles compared to match-play outside the congestion cycles while a non-significant but increased risk was observed in the two-match congestion cycles (IRR: 5.4 (95% CI 1.0 to 29.3), p=0.052). The risk of injury occurring in the first-half as a whole in the final match in the three-match congestion cycle was significantly higher compared to match-play outside the congestion cycles (table 3): 50.4 (95% CI 13 to 88) vs 19.4 (95% CI 9 to 29), IRR: 2.6 (95% CI 1.1 to 6.5), p=0.0386. A substantially higher albeit non-significant risk of injury occurring in the first 15 min of play was observed in the first-half in the final match in the three-match congestion cycle compared to match-play outside the congestion cycles: 14.4 (95% CI −6 to 34) vs 1.4 (95% CI −1 to 4), IRR: 10.4 (95% CI 1.0 to 114.9), p=0.057. A significantly higher risk of injury was observed from 75 min play onwards in the final match in the two-match congestion cycle compared to that in matches outside the congestion cycles: 26.0 (7 to 45) vs 8.3 (2 to 15), IRR: 3.1 (95% CI 1.1 to 9.3), p=0.0400. The aim of the present study was to analyse the impact of match congestion on injury risk and patterns in players belonging to a professional football club. In the same players, the main findings revealed that there was a significantly greater risk of sustaining an injury in the final 15 min of play in the second match in a congested cycle of two consecutive matches separated by ≤3 days interval in comparison to match-play outside the congested cycle. There was also a significantly greater overall risk of sustaining injury, particularly in the first-half of play, incurring an ankle sprain and a non-contact injury due to a ‘change in direction’ in the third match in a cycle of three matches played successively within a ≤4-day period in comparison to match-play outside the congested cycle. In contrast, the risk of re-injury and mean layoff time per injury were not increased in the final match during the congested cycles. In previous studies on the effects of match congestion on injury rates in professional football, a trend for a higher risk of sustaining injury in match-play over short congested periods has generally been reported irrespective of the study design. IRR values derived from reported data for short congested periods (≤4 days interval between matches vs ≥6 days interval) range from a 1.1 (29.0 vs 26.6, p=0.045)2 to a 5.1 (97.7 vs 19.3, p<0.001)4 fold greater risk of sustaining a time-loss injury. However, a common limitation in previous study designs is the failure to account for player rotation5 and there is a need for comparisons in the same players when they compete in and outside of congested fixture periods. In the present investigation, the incidence rate ratios within the aforementioned range were nevertheless reported with a 1.5-fold and 2.0-fold greater risk (the latter significantly) in the same players in the final match over the two short congestion cycles compared to match-play outside the cycles. Thus, these findings further confirm that exposure to short periods of fixture congestion increases the risk of injury in elite players. However, in previous studies,2 ,3 ,5 ,6 lower values for injury incidences (injuries per 1000 h exposure time) have generally been reported over congested fixture periods. Here, only data in the same players who were regularly exposed to fixture congestion and had a minimum of 75 min participation time were analysed potentially, providing a more realistic representation of the injury risk. Indeed, previous research has generally analysed injury data at a team level2 ,3 ,5 ,6 and the lower injury incidence values reported during congested fixture periods could be linked to player rotation policies that diluted the real risk of injury (eg, sporadic exposure over the season, players only competing in 1 out of 2 matches in cycles played in a short time frame, <75 min exposure time). In relation to the above findings, it is noteworthy that the high risk of injury related to fixture congestion observed in the present cohort occurred despite the systematic injury prevention (Nordic hamstring lowers, joint proprioception exercises and core stability exercises) and recovery interventions (eg, contrast therapy, compression garments) performed by the players between matches over these congested periods.4 ,6 This finding implies a need for re-examination of match scheduling at elite standards to ensure that players have sufficient recovery time between matches. Limited information exists on the type and location of injuries occurring during short periods of match congestion. A significantly higher risk (IRR: 1.3) of sustaining a muscle injury was reported in 27 professional European football teams during fixture congestion.2 Here, for non-contact injuries as a whole and specifically muscle strains, a trend, albeit non-significant towards an increased incidence in the final match in the two-match and three-match congestion cycles, was observed compared to match-play outside the cycles. In addition, while non-significant, there was a substantially greater risk of a strain to the hamstring region in both short congestion cycles (IRR: 2.0 and 2.6). Regarding ankle sprains, there was a 5.4-fold and 10.4-fold greater risk (the latter significantly) in the final match in the two-match and three-match congestion cycles. Taken together, these results are noteworthy as they suggest that the present players were more susceptible to non-contact injuries such as muscular strains and particularly joint sprain injuries during short periods of fixture congestion, suggesting a potential link with the accumulation of fatigue and/or incomplete physical recovery.4 Of note is the substantially higher incidence of muscle strain in matches separated by ≤3 days interval reported here compared to that observed in 27 elite European football teams (33.3 vs 11.2).2 Again, this discrepancy across studies could be explained by the inclusion here of data solely collected in the same players who were frequently exposed to the fixture congestion cycles. Previous epidemiological research has shown that injury occurrence generally and the risk of sustaining a strain to the hamstring region in particular are both augmented during the latter stages of football match-play at elite standards.7 ,8 However, no information exists on the temporal distribution of injuries incurred during periods of match congestion. Here, a significantly higher incidence of injuries was reported at the end of games (from 76 min play onwards) in the final match in the two-match congestion cycles compared to that in match-play outside the cycle. It is noteworthy that the majority (67%) of these injuries were muscle strains, of which 75% were to the hamstring region. It has previously been suggested that this time course susceptibility to muscular strain injury in the latter stages of match-play is linked to structural changes in muscle and cumulative mechanical stress inducing altered running kinematics.16 In addition, there was a significantly higher injury incidence in the first-half of play as a whole in the final match in a three-match congestion cycle compared to that during the same time period in match-play outside the cycle. Out of the injuries sustained, 57% were muscle strains and 28% sprains while 43% were linked to a change in direction when running. When combined with the eightfold significantly greater risk of incurring a non-contact injury generally due to a ‘change in direction’ when running, identified in the final match in the three-match congestion cycles, these results tend to support the potential association between accumulated fatigue and impaired sprinting mechanics, muscular strength and joint stability.17 Future work could attempt to identify potential trends in the temporal distribution and causes of injury in relation to match type and the typical schedules faced by teams (eg, European competition followed by League match). In the light of these findings, there are implications for practitioners as regards player substitution and rotation strategies in an attempt to reduce the time-related risk of injury presently identified over short periods of match congestion. There is also a need for investigations in which players perform consecutive football-specific 90 min intermittent running protocols that simulate the demands of match-play over ‘congested’ time scales similar to those employed here. This would enable analysis and potential identification of the cumulative effect of successive matches during congested periods on physical and physiological responses to play. A limitation acknowledged at the outset of this study was that the injury risk and patterns observed might only reflect this present cohort of players from a single elite football club. Similar investigations involving a larger sample of clubs internationally to increase statistical power and narrow the CIs for incidence rate ratios are necessary to verify the present findings. However, despite these limitations, this study has merit in that it investigates injury and match congestion using measures of injury data and exposure time in the same players. A further strength was its stringent inclusion criteria, six-season span and prospective methodology, the latter in respect of international recommended injury recording systems, thereby allowing injury data to be compared with future research findings. This is the first study to show that the risk of injury increases in the same players when they regularly compete in congested match cycles. The risk of injury is especially high in the final 15 min of the final matches in a two-match congestion cycle and in the first-half of the final game in a three-match congestion cycle. Rates of non-contact injury due to a ‘change in direction’ and ankle sprains are higher in the third match of a congested cycle. The findings support the importance of monitoring participation rates in players during congested match periods. Provides an insight into the need for individualising player rotation and substitution strategies to reduce the injury risk. Provides further support for UEFA recommendations that match schedules should be planned to ensure sufficient recovery time between matches.
. Contemporary issues in the physical preparation of elite players. In: Williams M, ed. Science & soccer III. London: Routledge, 2012:335–56. Contributors CC and FLG performed the data collection. CC, AM and GD conducted the statistical analysis on the data. CC, AM and GD organised the layout and presentation of the results. All authors planned the study. All authors completed the first draft of the injury survey. All authors contributed to finalising the final draft of the study. CC submitted the study.